This cute guy is the child of Amon, one of the Inner Demons-Lords. I knew Amon has a child for quite a while, but I never managed to capture it on paper until now. I call it Hrrkhan – what means the opposite of “trust in life/luck”//”hope/trust that everything will turn out fine”. This creature collects eyes, because it has no eyes itself. It infects the eyes of the victim with a special poison (breath), then the eyes start to absorb the energy of the victim and soon glow – when they glow, the harvest can begin & the demon steals the eyes and kills the victim. Sometimes it also keeps the skulls/bones as a trophy. 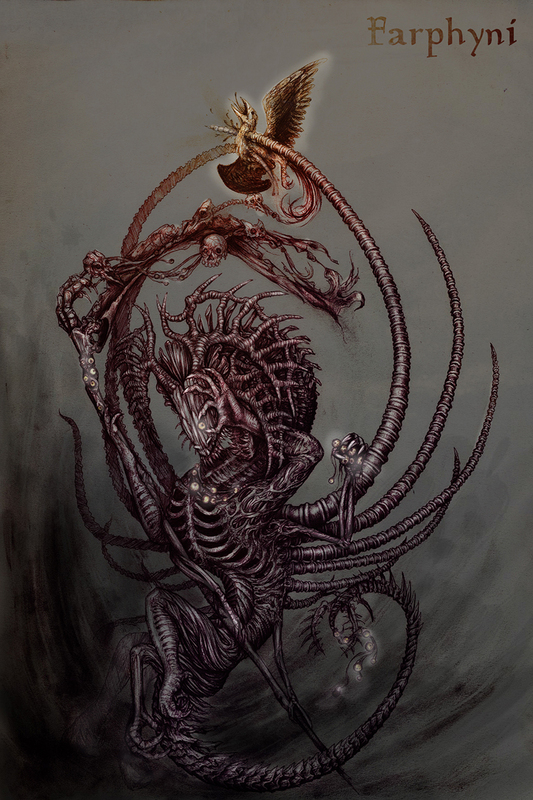 Now and then it also steals limbs/features of the victim to upgrade the body of itself (the tentacle-bones on its back are actually spines that it stole from other creatures; also the second pair of legs and arms).